So what is the food like on the Adventure Bus? After all, it is a bus, and we are camping, so what is it going to be, hamburgers and hot dogs every night? No way! 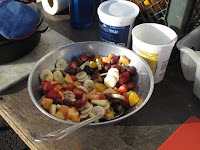 Food on the Adventure Bus is very much a part of the journey. 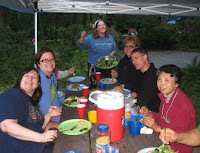 For starters, we know even though folks are on vacation, they still like to eat healthily. We also know that you need to be properly fueled for the climate and your activity level. Most importantly….. we LOVE to cook! Our Bus carries all the equipment for an outdoor kitchen that can do almost anything! Guests are often surprised at our extensive menu, and often ask where they can get our recipes. We strive to prepare and serve interesting, healthy and satisfying meals. We know that if you are going hungry, you probably aren’t happy! 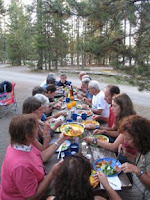 Breakfasts and Dinners are always hot meals and lunches are either packed sandwiches and snacks to be enjoyed out on the trail, or picnic style at the bus. When it is possible, we try and serve local dishes. 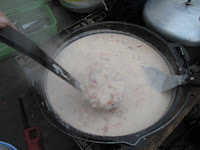 For example, on our Southwest tours we often serve Navajo Stew with Fry Bread. This dish uses a lot beans, squash and corn and is served over traditional Navajo style Fry Bread. On our Pacific Northwest tours, we prepare Salmon Chowder made with local onions, potatoes and smoked salmon. Meal time is a very social time. Although it is optional, most folks tend to lend a hand with meal prep and clean up. It is a great time to get to know others or share the day’s adventures. On occasion, we have fun cooking over an open fire. There is always someone in every group that has never done it before, and we love to give them the opportunity! As long as we know ahead of the tour, we can accommodate any kind of dietary need; vegetarian, vegan, gluten free, lactose intolerant, and nut, corn or wheat allergies. We serve a fresh fruit salad at every breakfast along with a hot entree. 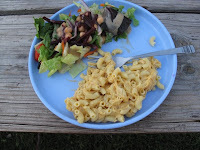 Most dinners include a fresh salad along with the hot entree. And there is always cereal and sandwich makings available if you don’t like what else is being served!